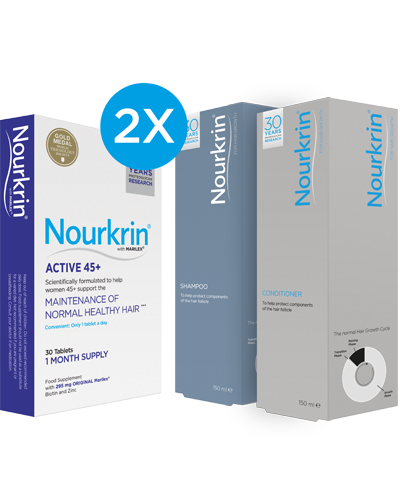 Nourkrin® Active 45+ is for all women in their forties, who want to maintain the normal health and quality of their hair despite a busy lifestyle. I would like to share my thought on Nourkrin®! It wouldn’t be too dramatic to say it saved me!! In the winter of 2012 (aged 46) around October, I started losing a bit more hair than normal when washing and brushing/styling. I have always been known for my hair, long blondish and extremely thick. So thick that I had to choose Hairdressers carefully as most would run a mile rather than thin/razor my hair for me to take the bulk out. By the end of November I had a carrier bag full of hair that I had lost. I think I was in denial that something was wrong yet kept all of the hair that I was shedding. I went to the Doctors who did blood tests that showed I was rapidly approaching the Peri-menopausal stage of life and said my hair would never be the same again and she was sure it would eventually slow down/stop. My hair loss was so dramatic that I felt I couldn’t just leave it and see what happened. I really felt that by the Christmas it would be very noticeable to people that something was wrong. I was actually stunned to feel so devastated at my hair loss. It wasn’t something I’d ever thought about. I drove home that day in what felt like panic. I had mentioned to a family member what was happening and when I showed her the bag of hair they were visibly shocked. The next day I had an extremely blessed phone call from a lady that worked with this family member. To this day I can’t thank her enough for ringing me! She recommended Nourkrin®. She had had the same situation as myself and found it had helped her. 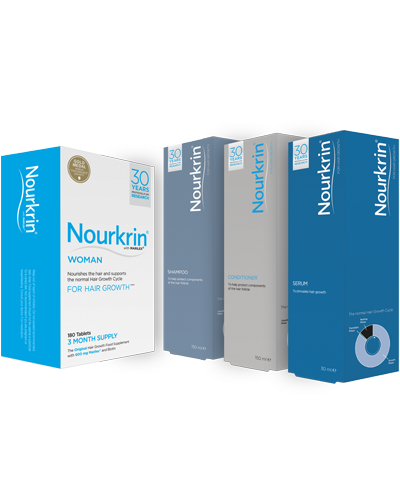 I ordered Nourkrin® immediately and by the tenth day of taking the tablets my hair loss started to slow down and within a month I was back to what I classed as normal shedding. I am still taking Nourkrin® today and my hairdresser says she now classes me as still having thick hair. It may not get back to how thick it was before but I can now hold my head up and feel a little more like I used to. I cannot be without Nourkrin®. They really were and are my saviour! Following the treatment programme with Nourkrin® Woman, it is advisable that Nourkrin® Active 45+ is started as soon as possible and continued as a maintenance programme until you are content with the quality and texture of your hair. This means that you can proactively provide the support required for your hair to maintain top quality, optimal appearance and its ability to grow normally – before the onset of a problem. Nourkrin® Active 45+ is completely safe and 100% drug-free. Marilex® (fractionated fish extract with specific lectican proteoglycans), zinc citrate dihydrate, D-biotin, bulking agents (microcrystalline cellulose; calcium hydrogen phosphate), stabilisers (hydroxypropyl methyl cellulose; talc; glycerol), glazing agents (magnesium salts of fatty acids), colours (titanium dioxide). (1 tablet in the morning taken with water after food). Subscribe to our newsletter to stay up to date on the newest research within the field of hair growth disorders and female hair loss, information about upcoming events and competitions with Nourkrin® Active 45+.